Just a little souvenir from May 2002. 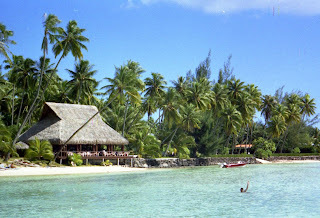 We had organised to stay 4 nights in a traditional fare in Moorea island. 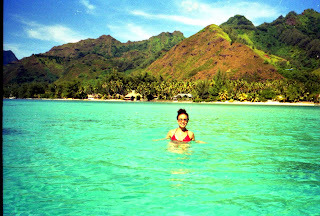 Moorea is one of the Society Islands of the Pacific. 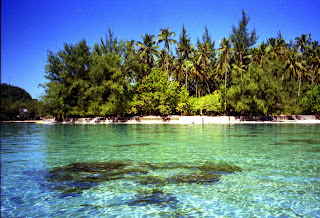 The Society Islands include Tahiti, Moorea and Bora Bora. 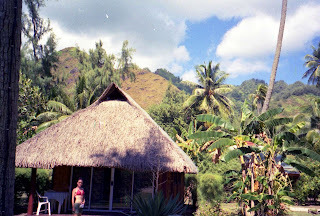 We never stayed in Papeete, preferring to fly straight to paradise. What I remember distinctly from Papeete airport was cracking up after seeing a huge crab wondering about in the ladies' toilets. That's right: a crab. The kind you cook on your BBQ. I can still visualise that orange tinted armour. How it snapped its claws and made a rattling sound as it advanced across the tiles. It seemed very sure of itself and only to observe its smug self-satisfaction, you would have to assume that it was the most natural thing in the world for a crab to wonder inside an international airport. We flew to Moora from Papeete on a small aircraft. It was amusing to see the pilot turn around to face the dozen or so passengers and greet us with "Hi guys, I'm your captain". I don't know about you but for me, seeing the pilot makes away with that microphone 'voice of authority' from the cockpit. All of a sudden, I start to doubt their competence. Irrational I know. I noticed that there was some squirming in the other seats too. Luckily, unlike a recent incident which did not go so well, we were lucky enough to survive the flight to Moorea. 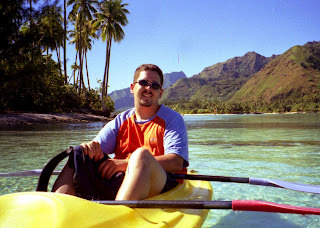 When we arrived, we were driven to our fare on the edge of the Moorea lagoon. 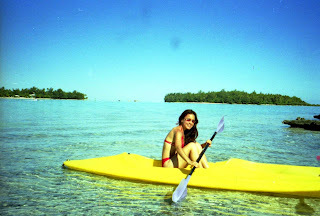 This is a gorgeous coral enclave with clear blue water and lovely islets that can be reached by canoes. The bank is lined with fares , tall palms and very very happy tourists. But I think I was the happiest. It was such a beautiful place. I loved it. This is our fare on the border of the lagoon. It had a traditional roof with high pyramidal shaped ceiling. I wouldn't call the conditions luxurious (you'd have to go to Bora Bora for that!!) but then why would you want to stay inside the fare considering the beauty outside? If it wasn't for the insects I probably would have slept outside. We had quite a few visits from wasps. I killed two, Jason killed two and they kept creeping inside during morning servicing because the cleaners would leave the sliding door wide open.... I'm allergic to bee stings so the fright came more from getting stung than anything else. This is a shot of Jason sitting across the pontoon, not far from the bank. A few steps from our fare was the kayak rental place. They were a little pricey but the experience of paddling about in such beauty was priceless. This is the view from the kayak as you approach the far end of the lagoon. 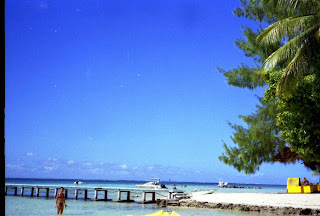 That's the islet where we took a break. 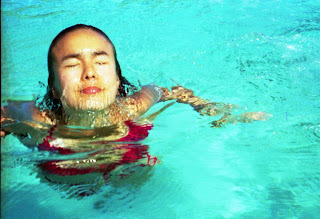 Me taking a dip in paradise. Swimming freely, opening my eyes in that crystal clear lagoon water and exploring its depth is one of the most wonderful things I have ever experienced in my life. Moorea is a beautiful island that you can cycle around in one day. No traffic. No red lights. It's awesome. If you have a good bike that is...Jason didn't. hmwah hah hah! I still remember how I tricked him into swapping bikes with me "since mine was way too high" (and I honestly couldn't get on it, let alone hop off). The result is that he got stuck with the bike that had a broken seat. Apart from that it was fun and we manage to ride up past the agricultural center (where, by the way, there are toilets and cold drinks). 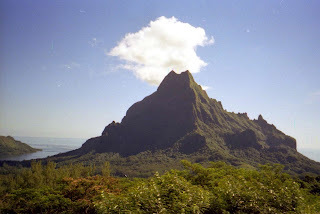 From there, we walked up to the lookouts for some amazing views of Moorea island. Worth the heavy sweat!!! 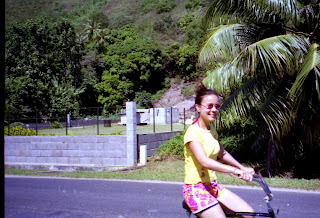 Me in my absurd tropical shorts, riding my absurd little bike. Cycling in high humidity is a very humbling and undignified experience. I was soaked by mid morning!!! Reuben will probably laugh. 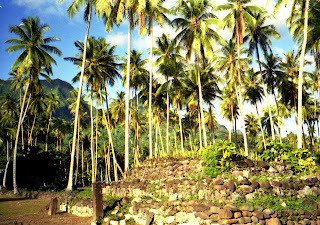 I admit that the interest in Moorea was far from cultural. I was only after a piece of paradise. Still we spent an afternoon taking a long walk to the marae. 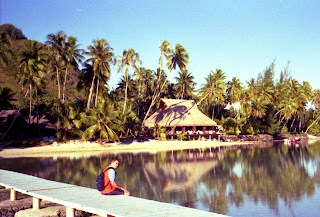 The marae are traditional sacred spots in Polynesian culture. Here's a picture of one. You can also do the normal touristy thing and attend a night of cultural feasting and dancing. Or you can do what a french couple did and hire a canoe with a hole in it, get in the middle of the lagoon, tip the canoe over,lose your stuff to the bottom and hire a mermaid (me) to help them find their bits. The most fun I had in a long time!!!! I did laugh, but only in empathy. I did my second ride out the new work place today, and didnt realise I was actually quite sore until I jumped on the bike seat. owies. I'm sure I'll find out exactly how undignifying it is, to ride in the high humidity of a South Pacific island. I'm going to Tonga for xmas and the new year, and will no doubt take to a bike. Here's hoping for one without a broken seat. Mind you, I have been bike riding in Vietnam. During that ride, it must have switched between hot sun and cold rain at least 3 times. Perhaps undignified is riding a bike in squelchy shorts and shoes.